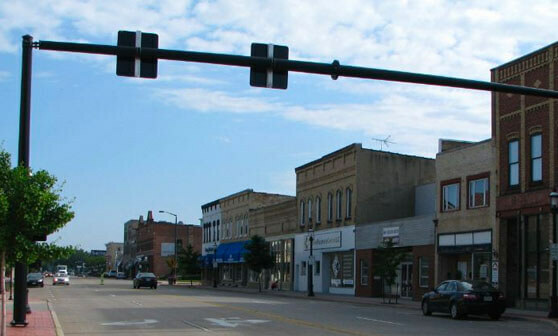 De Pere is located in Brown County, Wisconsin, just south of Green Bay.The Fox River is De Pere’s greatest geographic landmark; a major attraction for sport fishing, boating and water skiiing in the summer, and also ice fishing in the winter. The beautiful Fox River Trail runs right through the city, along the river and through Voyageur Park. The trail is a great resource for walking, hiking, roller-blading and cycling. Find out what De Pere, Wisconsin, has to offer you! The Fox River Trail offers a rich variety of scenery as it meanders from downtown Green Bay along the Fox River and passes through the Brown County communities of Allouez, De Pere, Rockland, Wrightstown and Holland. The 25 mile trail has approximately 7 miles of paved surface from the trailhead in downtown Green Bay to De Pere. The southern section is crushed stone and includes designated sections for horseback riding. As the trail surface changes in De Pere, it veers away from the river, transitioning to rural and agricultural areas to Ott Road just north of Hilbert in Calumet County. St. Norbert College, which abuts the banks of the Fox River on the city’s west side, was founded in October 1898 by Abbot Bernard Pennings, a Norbertine priest and educator. In 1952, the college became coeducational and today enrolls about 2,000 students. SNC offers undergraduate programs in more than 40 areas of study. St. Norbert is consistently ranked as one of the top five comprehensive colleges in the Midwest by U.S.News & World Report, and is also listed among “best in the Midwest” by Princeton Review. Over the years, Celebrate De Pere has become one of the premiere festivals in all of Wisconsin. Festivities include live entertainment on several stages all weekend, and have featured some major national entertainers including such names as Cheap Trick, Train, Survivor, Lover Boy, Eddie Money, Three Dog Night, Joan Jett and the Blackhearts, Rick Springfield, the BoDeans, April Wine and Blue Oyster Cult. There are games and shows for the kids and many food and beverage tents. One of the highlights of the weekend is the largest Memorial Day fireworks show in the state of Wisconsin, held on Sunday night. If you’re looking for a great location to see the fireworks from, try the Brown County Fairgrounds on the west side of the river.